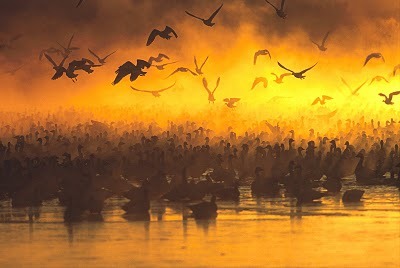 The White Choir: Light Geese /Hawks Aloft Inc.
Waterfowl at dawn - Bosque Del Apache National Wildlife Refuge. All images in this post by David Powell. “In complete darkness long before sunrise, you know that you are surrounded. The sound of the white choir crescendos, rising in intensity and volume until it floods your senses. As night gives way to day, the sensation transforms from audio to visual.” John Vradenburg, supervisory biologist at Bosque del Apache National Wildlife Refuge, shared his passion for the wintering waterfowl and Sandhill Cranes that are the signature birds of the refuge. 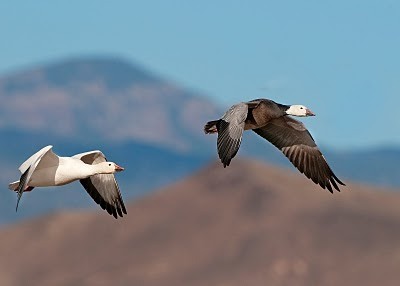 Light Geese, as they are referred to by biologists, are actually two different goose species, Snow Goose and Ross’ Goose. The Snow Goose is a medium-sized goose with a distinctive blackish ‘grinning patch’ or ‘smile’, while the Ross’ Goose is smaller and lacks the grin patch. Most adults of both species are completely white except for some gray under the wings and black wingtips. Light geese breed colonially in subarctic and arctic tundra near the coast on featureless terrain near ponds, shallow lakes, streams, or islands in braided deltas. Some high arctic colonies are located well inland on rolling terrain, exposed slopes of ravines, and cliff edges, but most nest in low-lying wet meadows with plenty of sedges and grasses. The preferred nesting areas are clear of snow early in the season and not flooded during spring thaw. Bosque del Apache NWR hosts about 45,000 of the two goose species each winter. They begin showing up in mid-October and stay until mid-March. The population peaks in late November through early December when migrants that will settle further south at wetlands in Mexico, stop here to rest and refuel. 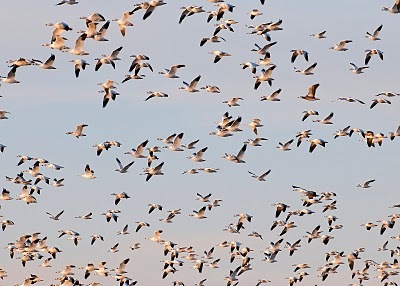 In the Middle Rio Grande Valley, populations appear stable, although numbers of light geese nationwide are millions beyond carrying capacity, according to Vradenburg. Overpopulation makes the birds susceptible to disease on wintering grounds and increases competition for nest sites and food resources on the Arctic tundra. Parents stay with their young throughout the first winter. Families travel together on both the southbound and northbound migrations, separating only after they return to the arctic breeding grounds. Family groups can easily be seen in migrating and wintering flocks and, amazingly, manage to remain together even when landing in the midst of a densely packed raft of floating geese at roost sites. Light goose hunting was banned in parts of the United States in 1916 due to low population levels. Hunting was allowed again in 1975 after the population had significantly increased. Today, hunting mortality, despite liberal bag limits, has so far failed to curb the 5% annual growth of most populations. Some populations have grown so large that the geese are destroying their nesting habitat. Light Geese did not always winter in the Middle Rio Grande Valley, but began showing up in the 1960s and 1970s. Vradenburg thinks the geese always flew over the valley but wintered in the highlands and central valley of Mexico, and along the Gulf coast. As more managed wetlands and reservoirs in Colorado created desirable roosting and foraging habitat, the population shifted. Bosque del Apache happened to be in the right spot for the geese and other birds to stop over. There is a blue morph of both species also occurs in about 10% of the population. The dark color of the blue morph is controlled by a single gene, with dark being partially dominant over white. If a pure dark goose mates with a white goose, the offspring will all be dark, except for a possible white belly. If two white geese mate, they have only white offspring. If two dark geese mate, they will have mostly dark offspring, but might have a few white ones too. 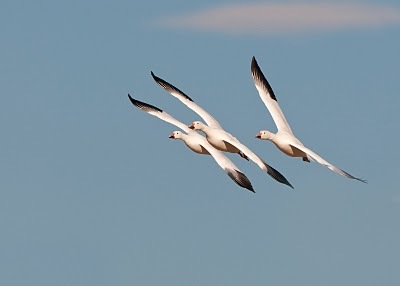 Bosque del Apache was established in 1939, for the purpose of providing habitat for migratory and breeding water birds. Before it became a wildlife refuge, it was mesic (wet) floodplain habitat with farmland and upland areas. Then, more natural conditions existed since the river had not yet been controlled. The refuge was developed when the levee was moved to control annual spring flooding and confine the Rio Grande. After the low flow channel was created, the refuge had to install and intensively manage the wetlands we see there today. “Heard long before they are seen, they let us know that that the migration season is upon us. 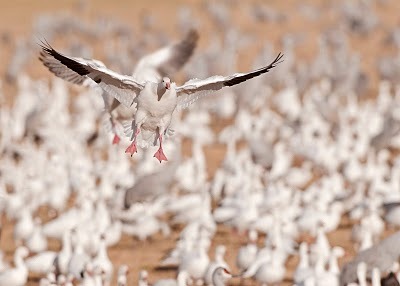 The Bosque and the Snow Geese, in particular, are a multi-sensational experience that combines the mass of thousands of geese, audio and visual, where you can literally lose your voice to the cacophony of mass of white flight,” reports the enthusiastic Vradenburg of the experience of visiting one of the premier wildlife refuges in the United States. At only $5/car, it makes for an impressive and entertaining winter day trip, only 120 miles south of Jemez Springs. If you go, plan to depart late morning, stopping at one of the local eateries for lunch, and arriving at the refuge in early afternoon. Be sure to stay for evening fly-in when the geese, cranes and ducks return to their roost sites for the night. You’ll be glad you stayed to hear the night choir.